Follow the smart money into the biggest option trades on Wall Street. Monitor, track & follow the largest order flows in the options market with our cutting edge software. Use real-time data analytics to get ahead of the market and know right away when big option plays are underway. 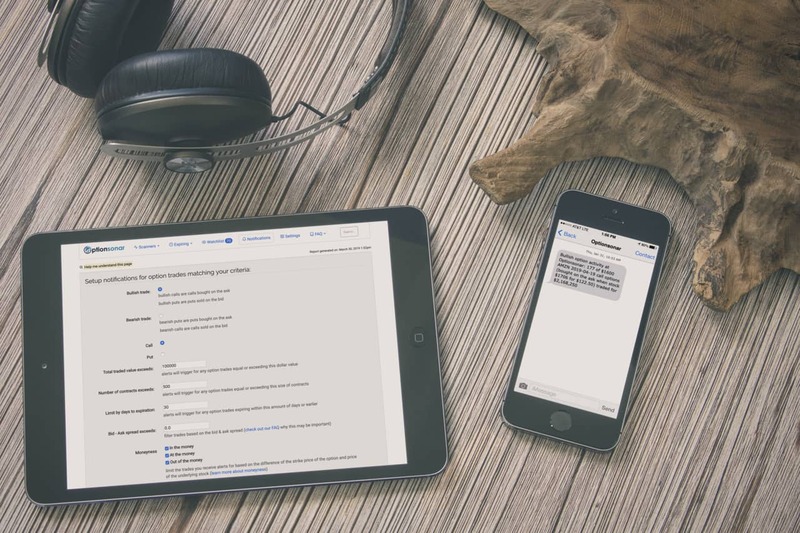 Order flow analysis no longer means being stuck to your screen. Receive email alerts as soon as an unusual option activity is detected. Add your own stocks to your watchlist so you are aware of any unusual options activity. Add perspective to your trading by seeing how the broad market will react to events. Setup custom option alerts that match your trading style. 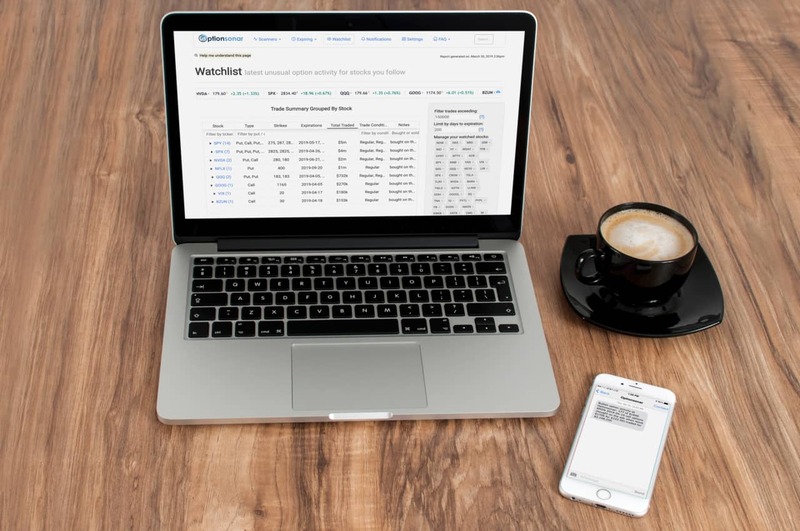 Add your favorite stock symbols to your options watchlist to follow along with the pros every trading day. Discover top option spreads for major ETFs & individual stocks. Short or long term, whatever your trading horizon you can filter and monitor a wide variety of expiration dates. 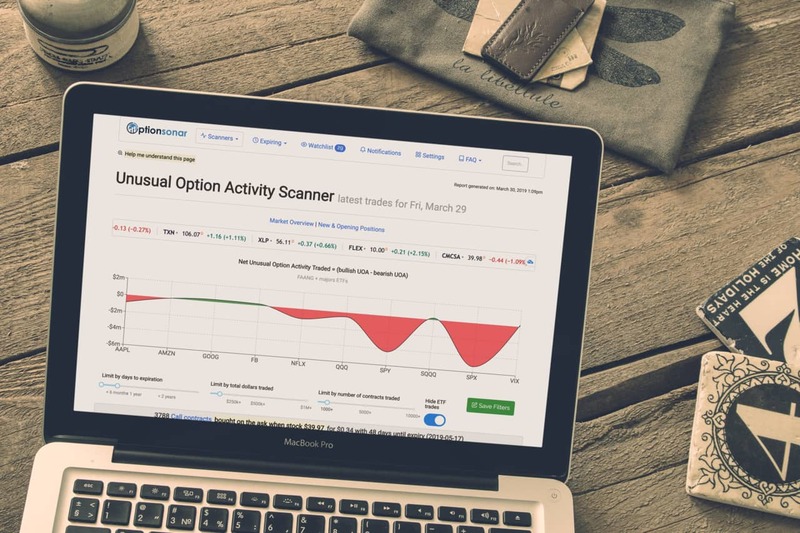 Customize your scanner with settings that match your trading style & receive dozens of option trade ideas throughout the day. Find new & opening positions, sweeps and many other complex trades. Track all the major option plays for your favorite stocks. Customize your own alerts to be notified by e-mail or SMS as soon as there is new unusual option activity. I could probably go into sales for you. I made back the purchase price in just 48 hours! It's really wonderful. I wish I would have thought of it first. It really saves me time and effort. Optionsonar is exactly what my trading has been lacking. I will refer everyone I know. Absolutely wonderful! I love your system. Just what I was looking for. I have gotten at least 50 times the value from Optionsonar. Pick between monthly or yearly pricing. It refers to order flow that is out of the ordinary. It includes stock options bought on the ask or sold on the bid with unusual size and daily volume compared to open interest. Find out more. Our software scans the options market throughout the trading day. As soon as trades are reported to the respective exchanges we are able to detect them and pass on the notification to you. What is the differene between the Twitter alerts and a full subscription? Twitter alerts are delayed and only a very small percentage of the detected trades are posted daily. Can I upgrade or cancel my subscription at any time? Absolutely. Our plans are flexible so you can choose month to month or yearly subscription. Updates to your plan take effect next renewal cycle.